I was 9-10 years old and riding my bike down to the boat docks. Off to the left hand side of the boat docks was our "island." When we stepped on this island, we felt as though nobody else knew about it. That what my friends and I had discovered was a mystery and that there were so many unanswered questions on this island, buried beneath all of the flooded debris lying around. Every piece of trash we picked up belonged to someone and every piece of debris has its own story. 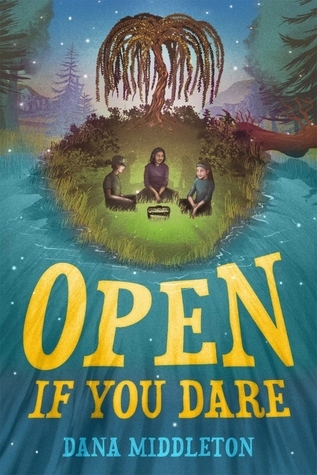 As I read Open If You Dare and followed along with Birdie, Ally, and Rose and their adventure to their "island" I couldn't help but feel a connection. When Birdie decides to open the box labeled open if you dare, I was right there, anxious and wondering what in the world this mystery was they were going to have to solve. As I kept turning the pages and following along their lives on their way into middle school, I remembered just how simple life was before I entered 6th grade - the grade where everything changes, especially for females. I could smell the lake rolling in on our island shore, I could feel a box in my hands, and my heart was aching to solve this murder mystery with Birdie and the girls. As you dig deeper into the story, you get to know Ally and Rose and their families. Ally's father is no longer in the picture, and she's the best BASEBALL pitcher on the summer league teams. Better than all the boys, her brother included. Ally is going to the other middle school in the fall, away from Birdie. Rose is from England and is moving back at the end of the summer. Birdie is the only one of the trio staying at the middle school they were all supposed to go to together. The girls are hurting, but on a mission to make this the summer they never forget. You will ride along over a few bumps along the way, but like myself, I truly feel like you will want so badly for the girls lives to continue they way they want and to know the answers to all of the clues for this murder mystery. Look for Dana's amazing middle grade story out October 17, 2017. Preorder here! Welcome to Teachers Who Read - we are students of Mrs. Thomas's class who have a love of reading and want others to know about our favorite authors! Let's start things off with introductions, what is your name and where are you from? I’m Dana Middleton. I grew up in Georgia – first in Atlanta but when I was a teenager, my family moved to the north Georgia mountains. As a grown up, I’ve mostly lived in Los Angeles, California, just down the road from Hollywood. My most recent book is called Open If You Dare. It’s about three best friends during the summer before middle school who dig up a box that holds clues about a murder back in 1973. As they solve the mystery, their friendships are revealed and tested over their last summer together. It took me a long time! I was always surrounded by writers (including my husband) but it took me forever to believe I could actually do it myself. Like the characters I write about, I had to learn to believe in myself. It was a process, bit by bit, that led to the thought: What if I tried to write a book? And when I did it, when I actually finished it, a whole world opened up for me. What were your middle grade years like? 4th, 5th grade? Did you enjoy reading or writing? I was more of a reader than a writer back then. I remember lots of snippets: teachers, friends, school projects, kickball, things like that, but mostly it was that feeling of growing up, of becoming this person with thoughts and feelings of her own that takes me back to 4th and 5th grade. My family lived in a neighborhood in Atlanta and during the summers, we ran free to a large extent and those memories really influenced my writing of Birdie, Ally and Rose during their Open If You Dare summer. It’s such a time of discovery because you’re not a little kid anymore. What was your favorite book as a child? What's your favorite middle grade book currently (aside from your own)? If I have to choose, it would probably be Charlotte’s Web. But I’ve got to say Where the Red Fern Grows is up there, too. Even though I haven’t read that book since childhood, I just remember crying buckets over it so it must have been good! My current favorite book? Impossible!! So, I’ll go with one of Birdie’s favorites—the one in which she hides her secret: When You Reach Me by Rebecca Stead. What connections can students make with your book/books? Why should our teacher put your books in our library? What a great question! Because how we learn to make connections as a child influences how we make connections for the rest of our lives. Friendships are connections. 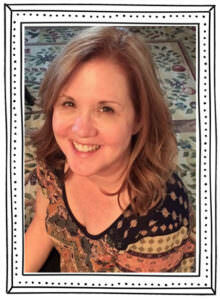 Through my characters, I want to encourage kids to make good decisions about friends. It’s important to choose friends who are kind and accept you as you are – and it’s super important to try and be that kind of friend in return. Also, my main characters find deeper connections with themselves by connecting with a mystery or a magical unknown while overcoming real life struggles. I want the students who read my books to come away believing in themselves a little bit more and having the bravery to think bigger about what’s possible in their lives. If you could recommend any books to us as 4/5th graders, what would it be? There are so many but here are some all time favorites: The Goose Girl by Shannon Hale, The Tale of Despereaux by Kate DiCamillo, and…uh… any Harry Potter by J.K. Rowling. 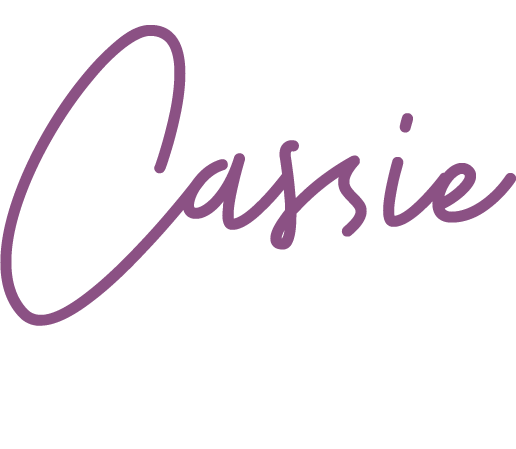 Recently, I discovered Lou Lou & Pea and the Mural Mystery by Jill Diamond and Circus Mirandus by Cassie Beasley and definitely recommend those books, too. Last question, any advice for young readers and writers? My advice for readers is easy. Just read. Reading is a great pleasure you’ll have your whole life. And if you’re a writer I have that same advice. READ. Reading makes you a better writer. And WRITE. Because the act of writing makes you a better writer. And FINISH. Because when you finish something, it builds confidence, plus once it’s done, you always go back and make it better. 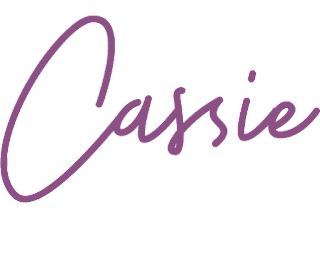 Thank you so much for participating in our author spotlight!